The National Council of Churches in the Philippines expresses grave concern on the potential appointment of retiring army chief, Lieutenant General Rolando Bautista to be the next Social Welfare and Development Secretary. We fear that President Rodrigo Duterte’s continuous show of penchant in appointing military men over civilians on high-level government positions secures a militarist approach to public governance. On October 4, President Duterte announced, during his dinner with the members of the Philippine Military Academy Alumni Association in Malacañang, that the Army Chief will become the next secretary of the Department of Social Welfare and Development (DSWD). Bautista is a member of the Philippine Military Academy (PMA) Class of 1985, who served as a commander of Duterte’s Presidential Security Group. Currently, he is the commander of the Army’s 1st Infantry Division who has jurisdiction over the embattled city of Marawi. While DSWD’s mission focuses on providing social protection for and welfare assistance to the poor, vulnerable, and disadvantaged sector, the Philippine Army’s principal mission to organize, train, and equip Army forces for the conduct of combat operations on the land is a total contrast. Furthermore, Bautista has no significant track record on providing such service, rather, we are extremely doubtful of his capacity to provide welfare to the least of our sisters and brothers, after seeing him in command of the battle in Marawi City against the ISIS-affiliated Maute group. How can we entrust the social welfare post to Lieutenant General Rolando Bautista when there are reports on the military becoming perpetrators of violence, coercion and deliberate deprivation themselves? It should be noted that in the span of one year of martial rule in Mindanao since its declaration on May 23, 2017, there were 22 cases of torture, 116 victims of frustrated extrajudicial killings, 89 victims of illegal arrest and detention, 336,124 victims of indiscriminate gunfire and aerial bombings, according to human rights group Karapatan. At least 404,654 individuals have also been reportedly displaced largely by aerial bombings. The AFP is also notorious for its rampant human rights violations including the putting up of blockades to militarized communities and preventing NGOs and people’s organizations to provide humanitarian assistance to such places. The DSWD which should provide services to all Filipinos regardless of political affiliation, as all humanitarian agencies do, will be further turned into a political weapon. Adding another former military personnel to a supposedly civilian bureaucracy will turn it into something akin to a military junta if we will not oppose this decision made by the President. 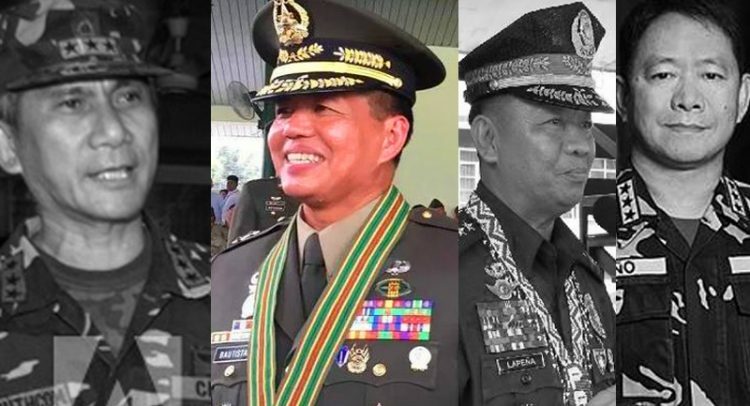 Over and over again, President Duterte showed his preference on retired generals and military men for top government posts. This is evident in the appointment of Gen. Eduardo Año as Interior Undersecretary; former military chief Roy Cimatu as head of the Department of Environment and Natural Resources; retired General Ricardo Visaya as the administrator of the National Irrigation Administration; and former PNP director Isidro Lapeña as Customs Commissioner. They may no longer serve as military men, but a year of service in their current government posts shows that they are still guided by their militarist principles. We have seen this in Año’s complete denial of the rampant extrajudicial killings in the country and Cimatu’s penchant for favoring big business over the rights of the people and the actual protection of the environment. Thus, we urge our member churches to pray, speak up and denounce this latest travesty. Let us oppose the appointment of a Military official as DSWD secretary, and demand a leader that has vast experience, interest, and passion on serving the people which will be most fit to fulfill the civilian post.